Earn up to 41 Vaportiser Loyalty Points. The Smok X-Priv Baby kit, small and subtle, glassy texture at front, cobra pattern at back, is wonderful more than one side. Its nobleness and stylishness highlight the new traits and extraordinary taste. 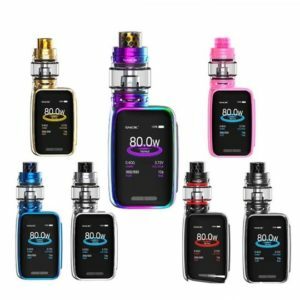 It has 2.0 inch large screen with high-definition to offer you more clear vaping data. The built-in 2300mAh large capacity and 80W output will inspire your endless vaping desire. Combined with TFV12 Big Baby Prince tank and powerful cores, you can enjoy deep and rich cloud taste. Take this delicate X-Priv Baby with you to discover more shinning points. Innovation keeps changing the vaping experience!